This research is dedicated to the memory of my late friends Peter Aitken and Bob MacCutcheon. Together we formed a wonderful research team. They are greatly missed. A link to the full story will be found at the end of this synopsis. This is the outline story of the successful search, via the internet, for the descendants of Alexander Bowie the builder of Georgian Stirling between the years 1806 and 1829. Through the genealogy newsgroups descendents have been contacted in NZ, Aus, Ca and Scotland. The complete text, should you wish all the details, can be accessed from the Bowie Index Link at the bottom of the page. Page Index Links--Quick links to sections within this synopsis page. 3. The story of William Bowie. 4. The story of Helen Bowie/Philp. 5. David and Helen emigrate to New Zealand. 6. Early days in New Zealand. 8. Comments about the research. 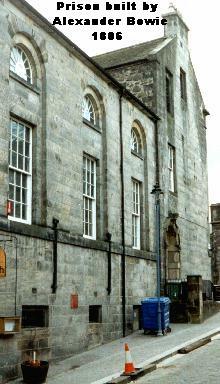 Alexander Bowie was not a native of Stirling and only came to the Burgh around 1802. It has been very difficult to establish his genealogy but accurate evidence points firmly to his birth in the village of Muthill, in Perthshire, as being his birth place in 1766. The first time that he appears in the Town records is on the 3rd August 1804 when he applied to join the Incorporation of Mechanics as a Wright, This was one of the means of regulating the labour force by ensuring that standards of workmanship were maintained. During the years 1806-1808 Bowie was engaged with Thomas Traquair, a local joiner in the building of the new prison attached to the Tollbooth. Considering Bowie�s standing in the Burgh as a Wright and Traquair a Burgess it is likely that the latter was the senior partner in the venture. On the 3rd of February 1807, when the prison project was well under way, Bowie again applied to the Incorporation of Mechanics, to be recognised, this time, as a Mason. February 1808 saw a major change in Bowie�s life when he married Margaret Hill the daughter of Alexander Hill a well known local Maltster, Burgess, and Guild Brother and the new family connections gave Bowie the social standing in the town of Stirling that his earlier life lacked. The Hills were one of the main families of the town with marriage links tying them to the Forresters of Craigannet, Walter Glas of Sheriffmuirlands and the Gillies family of Gormyre. In 1808 Bowie, took advantage of these family connections, in particular his relationship to Alexander Hill when he applied to become a Burgess. During the next five or six years Bowie appears in the Burgh records as undertaking a number of small pieces of work. He developed his building skills when he bought ground in Allan Park on which he then built Georgian-style houses, characterised by a grey ashlar sandstone finish rather than the brown whinstone , quarried locally and typical of the town architecture. In Allan Park, Bowie himself owned and developed a single detached house at No. 11 and two balanced blocks of terraced houses on both sides of the road ( Nos. 1�9 and 2�6) . These he built as a speculative enterprise and they show a utilitarianism not usually associated with Georgian architecture. Clearly he was building to a budget. He located his stoneyard on his land on, and behind, the property that is now Haddow�s off-licence in Dumbarton Rd. The distinctive stone used in all his sandstone buildings, he quarried from Thorneydyke quarry in the hills above Dunipace and transported it to Stirling for finishing . 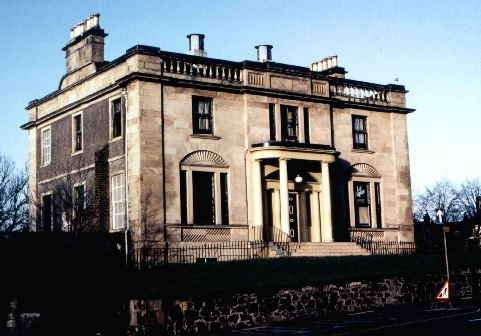 His other great project, undertaken for his wife�s uncle, Robert Gillies tanner and sometime Provost of Stirling, was the building of Craigs House at the foot of The Craigs and opposite the Tannery. This project is probably the most graceful of Bowie�s houses and has all the usual architectural features associated with the grander style of Georgian house. Clearly, to Robert Gillies money was not a problem and one assumes that the elaborate appearance of the building did wonders for Bowie�s image as a builder/architect. In many ways the story of the Bowie family is a tragic one. Nine months after Alexander Bowie married Margaret Hill their first child William was born. After that Margaret gave birth with amazing regularity almost every two years until 1825. In all the Bowies had ten children. Of the ten children the first two Alexander's and David died in infancy. Little is known about Mathew who died in 1829 at the age of fifteen and Alexander who died in 1840 at age 20. Margaret died unmarried in 1845 also age 20 and her sister Christian or Christine died in childbirth about the same time having been married for only a year. Robert, something of a problem to the family, was last heard of heading for Jamaica. His fate is unknown. The greatest amount of surviving information is that about William and Helen. Margaret Bowie, the wife of Alexander, died of what would appear to be Tuberculosis in 1826 leaving Bowie to care for seven children. Bowie himself died in 1829 leaving the extended family to care for the surviving five children. The decade 1820 to 1829 was truly a tragic one for the Bowie family. At the beginning of that period the family consisted of Father, Mother and five children with two more born during that time. By the end of the decade only five orphans survived. Educationally the highest achiever of the Bowie children William attended The Grammar School at Stirling and matriculated at the University of Glasgow at age 14. 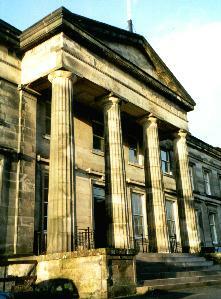 After two years studying there, he enrolled at the University of Edinburgh in 1825 to study Medicine. He graduated in 1827 (aged 19) as a Licentiate of the Royal College of Surgeons, studying under the famous Dr Robert Knox. William missed, by six months, the Burke and Hare situation that embroiled Knox in 1828. In August 1827 William took a job in Portpatrick as the local Surgeon but his health failed after only seven months and he came home to Stirling in March 1828, dying, from tuberculosis, at age 20 in November of that year as had his mother only two years earlier. This story is documented in detail from the letters from both father and son. archived in Canada. It is located in the Appendix to the full Bowie/Philp story. With the other nine Bowie children dying at a young age Helen�s longevity, dying as she did at age 84, is exceptional and undoubtedly reflects her totally different life situation. Brought up after her father�s death by her Mother�s maiden Aunt, Helen appears to have been a teacher. She remained unmarried until July 1856 when, at the age of 33, she married David Philp a teller in the Bank of Scotland in Perth. After a honeymoon in Paris they briefly settled in a house in Perth. In March 1857 David made a decision that was to influence their lives dramatically. He left the Bank of Scotland, where he had worked since 1836, to become Manager of the recently opened Callendar branch of the Edinburgh and Glasgow Bank. Sadly this Bank only survived for a short while and in May 1858 a Bank crash was narrowly averted by a Clydesdale Bank take-over. 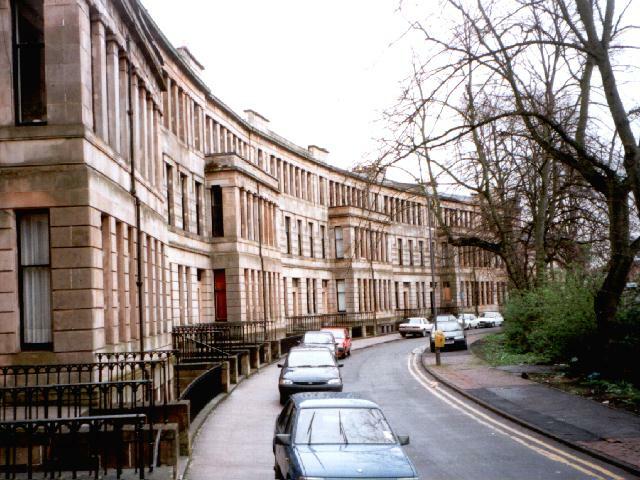 David and Helen moved with the Clydesdale Bank and stayed in a newly built �Greek� Thomson house in Walmer Crescent Glasgow. David left the Clydesdale Bank in 1862 to start the shawl manufacturing business of Hutton Philp and Co with an address at 1 Princes Square. This business does not seem to have lasted more than a year and, in 1863 the momentous decision to emigrate to New Zealand was made by David and Helen. On the 4th of May 1863 the family, David, Helen, Margaret (4 years), James (3 years) and Andrew (10 months), set sail from London on board the Clipper ship �Queen of Beauty�. The round of leave-taking to elderly aunts and other family members must have been painful and the decision surely reflects the desperate straits into which the Philp fortunes had fallen. A desperate situation that called for a drastic solution. The voyage of the Queen of Beauty, well documented in the main the story, was fairly uneventful �apart from a wild storm in the �roaring forties� and the ship being stopped and boarded when it was off Rio De Janeiro, by the infamous Confederate ship the �Alabama� under the command of the equally infamous Captain Raphael Semmes. 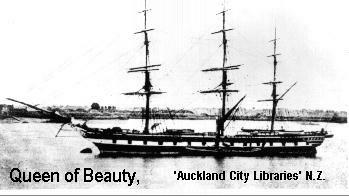 The Queen of Beauty arrived in Auckland on the 9th of August 1863 after a voyage of 96 days. The passenger list printed the next day in an Auckland newspaper indicates that David, Helen and family travelled steerage and not in one of the cabins. Another fact that surely is a reflection of their reduced circumstances before leaving Scotland. A house had been arranged for David and Helen through the contacts of Helen�s cousin�s husband in London and a few months later we find David in the employment of the recently formed Bank of Auckland. He eventually became its branch manager at Onehunga, a thriving new port close to Auckland. In 1864 their fourth child Agnes Helen was born. History sadly repeated itself and again the couple were caught up in a bank crash when the Bank of Auckland went into liquidation in 1867. This, in turn, led to yet another major career move for David when he became a Mining Manager in the frontier town of Shortland where the Thames gold field was just opening up. Helen and the children remained in Onehunga until David had built a wooden house on Mackay Street. They subsequently joined him in 1868. With the descriptions of Shortland emphasising the mud and the incessant noise of machinery we cannot help but contrast the family�s lifestyle there with that of the elegance of their previous Bowie or �Greek� Thomson buildings. They remained in Shortland until the late 1870s when David retired and the family returned again to Auckland where David died in 1883 at the age of 63. The eldest of David and Helen�s children married Harry Carse a noted New Zealand plant collector. The Herbarium near Christchurch is named after him. They had four children and all their descendants continued to live in New Zealand except the line through Harry Carse junior who returned to Scotland. Present day descendants live in Dysart. At an early age James became a journalist and worked for both Thames and Auckland newspapers. In 1888 he moved to Sydney and there founded the first Chinese newspaper. He subsequently moved to Brisbane to the �Courier�. He was also the author of a number of books. 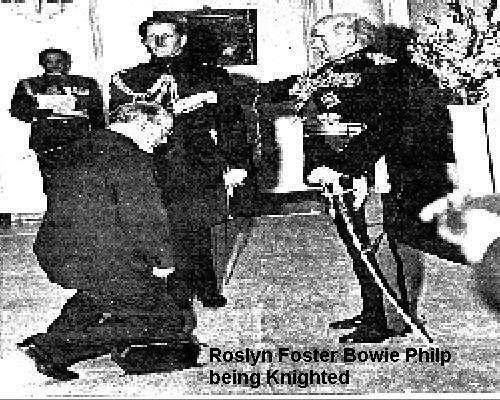 His son Roslyn Foster Bowie Philp, Alexander Bowie�s great-grandson, was knighted in 1958 for his community work and services to the Queensland Bar. His Great Grandfather Alexander Bowie, a definite social climber in Stirling, would, undoubtedly, have enjoyed this event. His descendants currently live in Queensland. James died in 1935 in Brisbane. It has been almost impossible to research Andrew�s life. He certainly married�moved to Australia and then back to New Zealand�and none of his children seem to have had any family. Married a Canadian, Thomas Wetherald, in Australia and, after nursing Helen at her death in Sydney in 1908, she subsequently moved with her husband and son, to Canada in 1912. Their descendants, also with the Bowie name, presently live in Toronto. The initial research of the Bowie story came about when, in 1979, my wife and I bought number seven Allan Park and I asked the lawyer for a photocopy of the title deeds. This led to a research of the house and its owners and, eventually, to research about Allan Park itself. 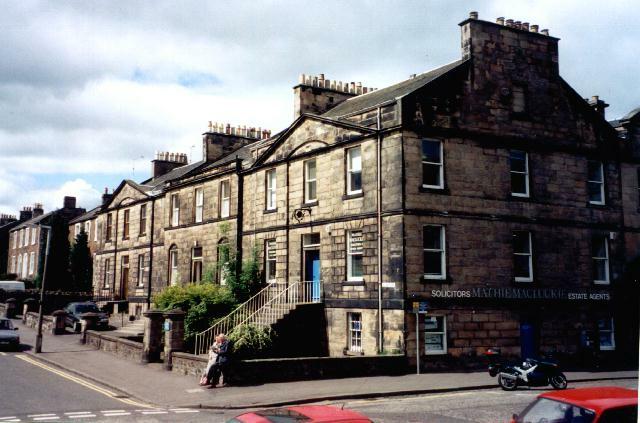 The Kings Park Community Council of the time brought Bob McCutcheon, Peter Aitken and myself together resulting in the two publications� Kings Park� and �The Homesteads� under the series title Notes for a New History of Stirling. At this time the first draft of the Bowie story, as we knew it then, was written up. It ended by saying that the beginning and the end of that story might never be clear because we could not find where Bowie originally came from or what became of his descendants. Because of a brief note in the local paper we were aware that Helen and David planned to emigrate to Shortland in New Zealand but the Embassy assured us that no such place existed. There the research lay for almost ten years until December 1995 when I logged on to the Internet for the first time. Via the medium of the Genealogy Newsgroups I identified Shortland within four days, found that the family had arrived in New Zealand in August 1863 and within ten weeks I was telephoning the first living descendant having traced his family, again via the Internet, to Australia. The internet contact with Bowie�s descendants has unearthed an amazing number of original letters dating from 1811 to Alexander Bowie and various members of his extended family. Almost all of this material must have been collected by Helen and taken by her to New Zealand in the first instance and subsequently on to Australia. Eventually most of it found its way to Canada with the youngest daughter. The discovery of this material has given remarkable insight into the more personal aspects of the family and I am deeply grateful to both the family members and the Internet genealogists in New Zealand and Australia who have made this research possible.